In the spring of 1945 a CXI(F) Squadron Spitfire PT410 took off on an early morning mission from the Squadrons' forward operating base in Italy. It was piloted by W/O John Henry Coates, known as "Harry", who heralded from York, a trained railways draughtsman who had volunteered for service in the RAF. On the day of his death, 05 March 1945, he should have been on leave, but swapped duties to fly on the mission, which was to protect bombers targeting barges on a canal near Cavarzere, Italy. 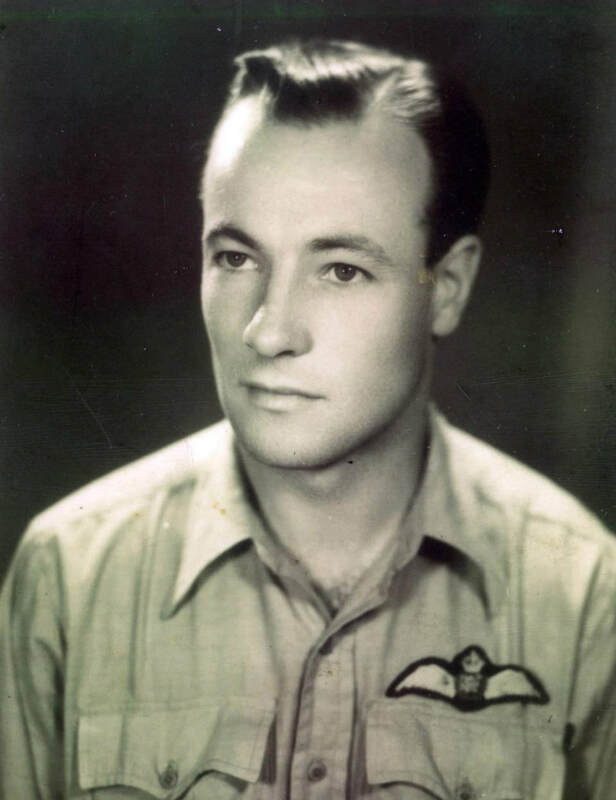 His aircraft was hit by anti-aircraft flak and crashed not far from Venice, disappearing into some marshy ground between 2 rivers and was never recovered. He was just 24 years old. 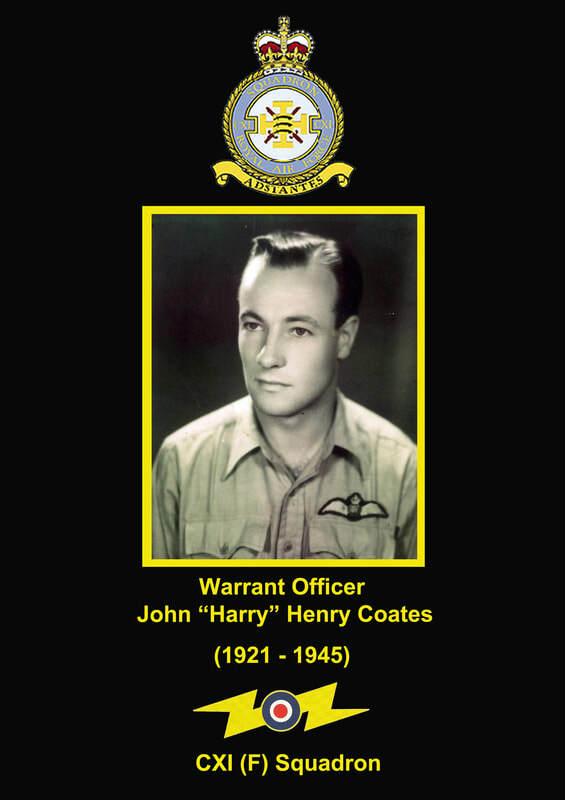 After the war W/O John Coates' name was engraved on the Malta War Memorial commemorating the 2,298 Commonwealth air crew killed in battles around the Mediterranean and with no known grave. It was then a period of 72 years before a team of volunteers of the "Romagna Air Finders", a group of Italians who research and recover missing aircraft in Italy, were able to work out the location of a crashed spitfire in the Cavarzere area. An intense period of research and discussions with living eyewitnesses followed and in October 2017 an operation was launched to recover the Spitfire. During the recovery it was discovered that the pilots remains were still in the aircraft. At this time the pilots identity was not know, and the "Romagna Air Finders" embarked upon the difficult task of identifying him. During the excavation of the aircraft, part of the fuselage was recovered, on which can be made out the flight number PT410 and Warrant Officer insignia, together with pilot wings were also found. Clues that would lead to the identification of Warrant Officer Coates and confirmation by the Joint Casualty and Compassionate Centre of the UK in a DNA comparison involving a relative. 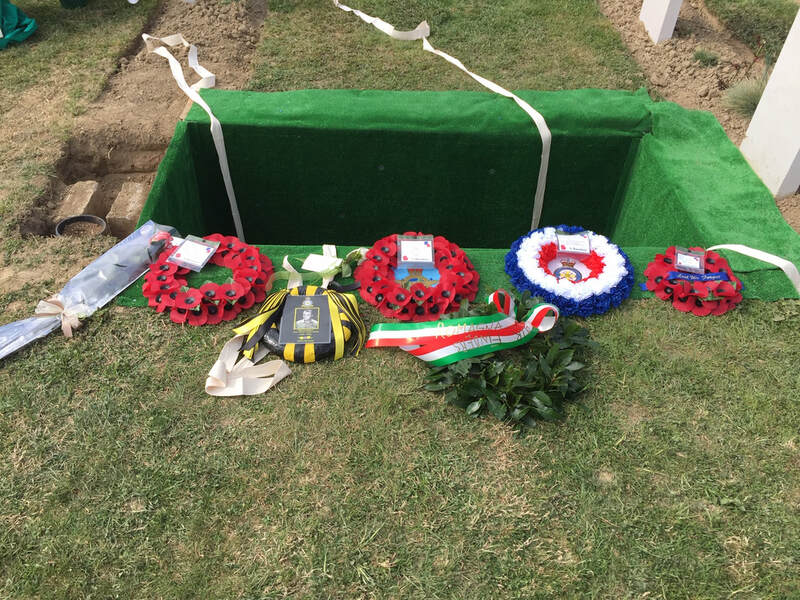 After over 74 years hidden from the world, Warrant Officer John "Harry" Henry Coates was finally laid to rest, with 22 members of his family watching on. 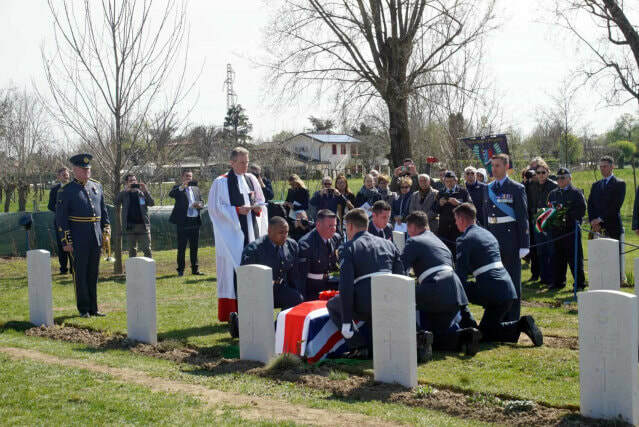 ​Following a church service at the Cathedral of San Mauro in Cavarzere, the coffin was carried by personnel from RAF Halton in Buckinghamshire, with wreathes being laid at a graveside ceremony during a full military burial at Commonwealth War Graves Commision's (CWGC) Padua War Cemetery, Italy. ​The service, organised by Louise Dorrs of the Joint Casualty and Compassionate Centre, UK, was conducted by the Reverend (Dr) Group Captain Giles Legood, Deputy Chaplain in Chief (Operations), RAF and attended by family members, British Defence Staff, CXI(F) Squadron Association representatives, members of the "Romagna Air Finders", CWGC staff and local dignitaries. 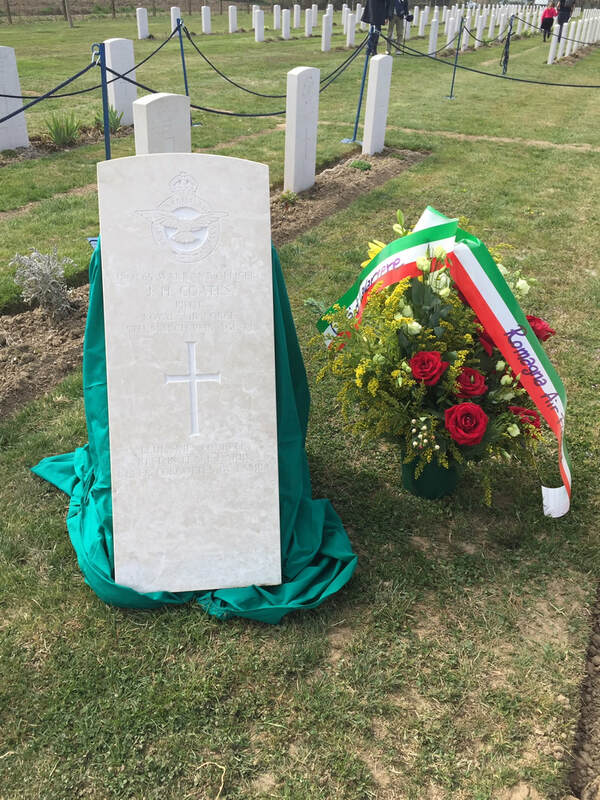 ​​A card from Air Vice-Marshal Phil Roser CB MBE RAF (Retd), President of CXI(F) Squadron Association was presented to W/O Coates' niece Shelagh Coates and a wreath in CXI(F) Squadron colours was laid at the grave side by Association member Jonathan Pitt. 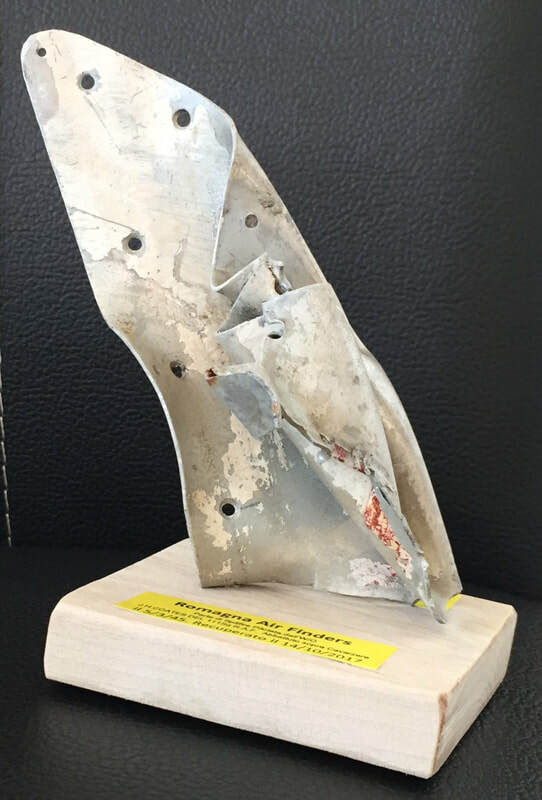 A fuselage piece of Spitfire PT410, the aircraft flown by W/O John Henry Coates the day he was shot down over Italy and as presented by the Romanga Air Finders to CXI(F) Squadron Association on the occasion of his military funeral at the CWGC Cemetary, Padua, Italy on 27 March 2019. After a number of speeches at a reception that followed the funeral service, Leo Venieri, the President of the "Romagna Air Finders" presented the CXI(F) Squadron Association with a mounted piece of "Harry's" Spitfire PT410, which has been placed with the Squadron Silver as a reminder of the great sacrifice made by Warrant Officer John "Harry" Henry Coates.